Here is another great grain salad from Peter Berley’s Go With The Grain cooking class at The Brooklyn Kitchen. In the class, we used freekah instead of bulgur. You can also substitute Israeli couscous. This salad can be served hot, warm, or cold. 2. In a small saucepan over high heat, bring 1 1/4 cups of water to a boil. Stir in the bulgur and 1/2 teaspoon salt, cover the pan, and simmer for 1 minute. Take the pan off the heat and let rest, covered, until all water has been absorbed, about 20 minutes. 3. In an 8 to 10-inch oven-proof saute pan over medium heat, stir together the rest of the ingredients and season with more salt. When the chickpeas begin to sizzle, transfer the pan to the oven. Roast for 20 minutes, stirring halfway through. 4. 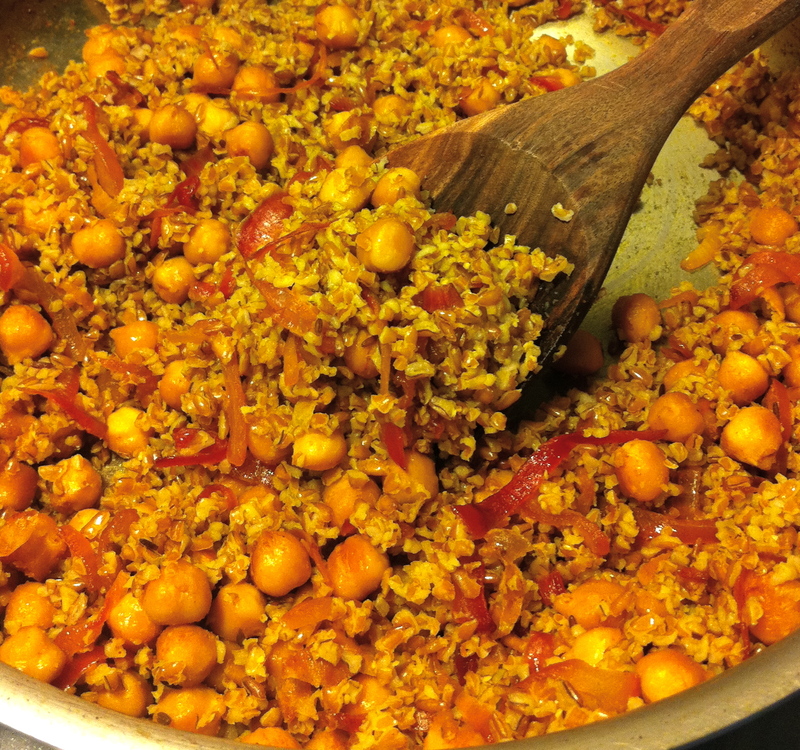 Remove and discard the bay leaves, and stir the bulgur into the chickpeas. Season with salt to taste, and serve hot, warm, or at room temperature.